More delicious pizza in lovely Brighton! And, you can get it delivered! I think I may have topped my own vegan pizza sampling. 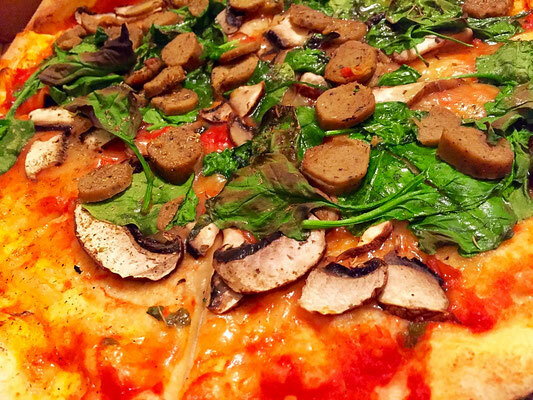 I tried one of the newest eats in Brighton, and I was really pleasantly surprised to discover a delicious vegan pizza from Pizza Me. They are on point with the cheese! I'm really into delivery of vegan goods whenever it's possible. It makes me happy that vegan food delivery is becoming so common and I feel the need to personally support the service! So, I didn't make it into the restaurant for this one, instead I sat on the couch and waited for the lovely people from Just Eat to bring it to me. Also, it was raining. Because England. So, that's the second reason for getting delivery. Also, I'm quite lazy. That's the third reason. So, yeah. I tried the two vegan pizzas I could find with the most vegan stuff on them, the No Meat ME Vegan and the ME Vegan Bangers. 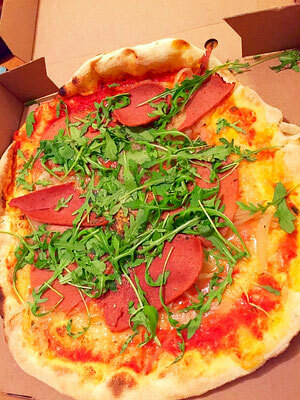 The No Meat ME Vegan was made with tomato sauce, vegan mozzarella, ham, bacon, onions and rocket. Great balance of meat and cheese. 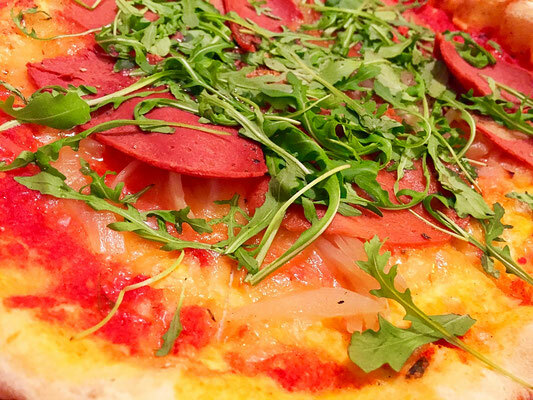 Super fresh ingredients including the bright green rocket on top. Nom. 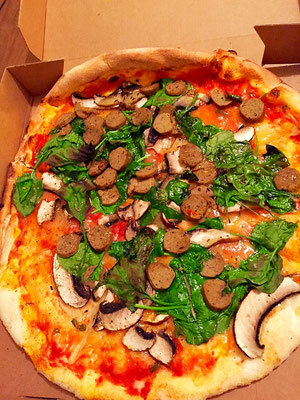 The ME Vegan Bangers had tomato sauce, vegan mozzarella, sausage, spinach and mushrooms. 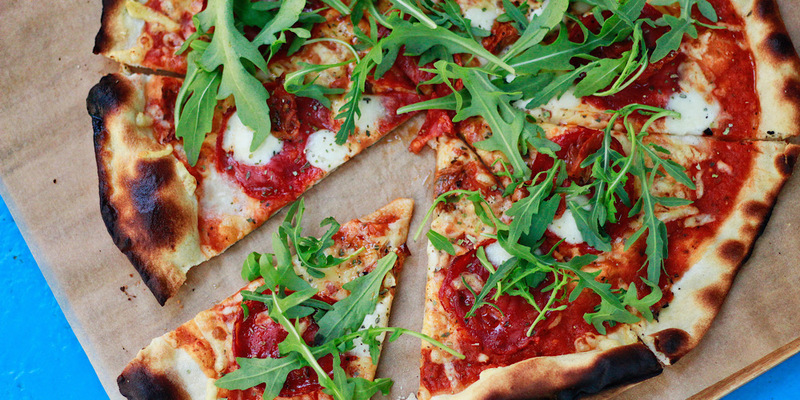 Kindof a perfect pizza combo right there. This one was also quite delicious, perfectly melty stringy cheese, savory sausages and yummy veggies. They definitely don't skimp on ingredients, that's for sure! Super filling and super tasty. This review was performed anonymously and product paid for by Burger Abroad. I was trying to decide which one I liked better, and just before my brain exploded, I had the epiphany - Self! Why are you trying to choose between cool things that you like? This isn't Sophie's Choice. This is pizza. So, in conclusion, they're both good! Try them! Check out Pizza Me. Pop into their shop in Elm Grove because they do offer some sweet deals. You can get pizza by the slice there for only £2.00! They also offer a Happy Hour, where you can get 3 slices for the price of 2. Can't beat that!